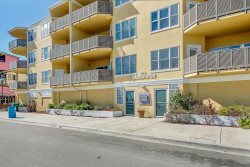 Third FLOOR/ 3 BEDROOM BEACHFRONT CONDO WITH OCEAN FRONT BALCONY, AMAZING BEACH VIEWS! Fort Screven is a beachfront condo on the North point of the island. The spacious condo features unobstructed views of the beach and the Atlantic Ocean. Located on the main oceanfront side of the North end of Tybee, you can enjoy a quieter beach location and are within walking distance to restaurants and shopping. This property has three bedrooms and three full baths. Enjoy ocean breezes from the comfort of the balcony off the living room. The master bedroom has a king size bed and another private balcony where you will enjoy fabulous views of ships, shrimp boats, and dolphins in the ocean. The second and third bedroom has a Queen bed and two double beds. Fort Screven is within walking distance to the Tybee lighthouse, Tybee Island Museum, Jaycee Park, shops, and restaurants. The building has a Handicap friendly (elevator, not ADA compliant). PLEASE NOTE there is garage parking for 2 vehicles and larger SUV's may not fit, especially during peak/high season.